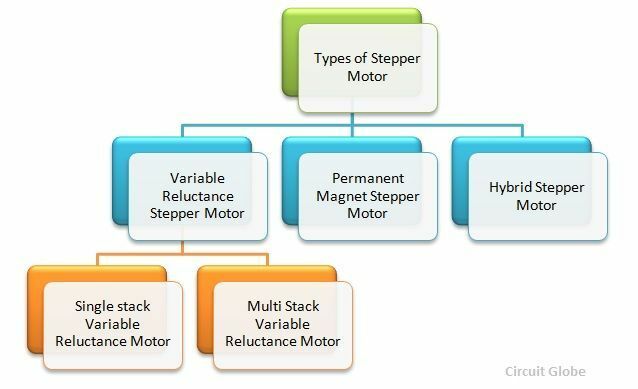 The name Stepper Motor itself shows that the rotor movement is in the form of various steps or discrete steps. It is also known as Stepping Motor. The number of pulses fed into the controller circuit determines the angular rotation of the motor. Each input pulse produces one step of the angular movement. The drive is considered as an analog to digital converter. It has an inbuilt logic, which causes appropriate windings to be energised and de-energized by the solid state switches in the required sequence. The variable reluctance motor is divided into two types. They are known as Single stack variable reluctance motor and Multi-stack variable reluctance motor. Definition: Step angle is defined as the angle which the rotor of a stepper motor moves when one pulse is applied to the input of the stator. The positioning of a motor is decided by the step angle and is expressed in degrees. The resolution or the step number of a motor is the number of steps it makes in one revolution of the rotor. Smaller the step angle higher the resolution of the positioning of the stepper motor. The accuracy of positioning of the objects by the motor depends on the resolution. Higher the resolution greater will be the accuracy. Some precision motors can make 1000 steps in one revolution with a step angle of 0.36 degrees. A standard motor will have a step angle of 1.8 degrees with 200 steps per revolution. The various step angles like 90, 45 and 15 degrees are common in simple motors. The number of phases can vary from two to six. Small steps angle can be obtained by using slotted pole pieces. The motor is simple in construction, reliable. At the standstill condition, the motor has full torque. The motors are less costly. The stepper motor has an excellent and accurate starting, stopping and reversing response. The motor uses more current as compared to the DC motor. At the higher speed, the value of torque reduces. The Resonance condition arises and requires micro stepping. At the high speed, the control is not possible. It’s interesting how you said that a stepper motor essentially moves things at an angle like a step. This could be really helpful in doing tasks that a person can’t or getting a really good angle on a specific turn. That way you get more consistent and precise movement because it is controlled by a machine.